Not exactly trending like “fatbikes”, touring bikes with tyre clearance in the 2”-2.4” range have been popping up recently. 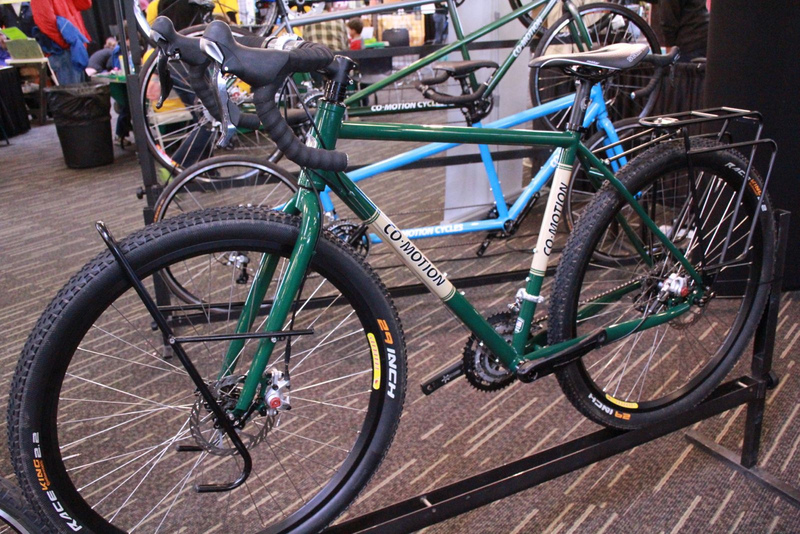 Some are designed mainly as on-road touring bikes, such as the Surly Long Haul Trucker, of which the smaller sizes can accommodate 26×2.1” tyres. I recently saw that Co-Motion is making a 26”-wheeled touring bike equipped with disc brakes. For heavy duty or expedition-style touring, 26” wheels make a lot of sense. In case of breakages, 26” tubes/tyres/rims are more accessible than 700C in most areas, and a smaller diameter rim is always stronger for a given rim extrusion (ie, cross section). With the wide variety of 29er tyres now available, there are a number of big-wheeled bikes hitting the market such as the Salsa Fargo or Co-Motion’s Divide. The bigger tyre diameter rolls easier compared to 26” as the riding surface grows rougher, but the huge wheels and frames built for them can be cumbersome for smaller riders. Even for taller riders, it’s hard to extract agility from a tall bike with massive wheels and a 110cm wheelbase. An actual trend coming out of the midwest is the grassroots races and rides known as “gravel grinders”. Also occasionally called “adventure rides”, these are endurance rides that take place on long stretches of rural roads, which are often rutted pavement or packed gravel, perhaps poorly maintained. In spirit, gravel grinders harken back to an earlier era of cycling decades before Eisenhower and interstate highways. Equipment wise, bikes being marketed for this use vary from dropbar 29ers to cyclocross bikes, and disc brakes are a very popular option. 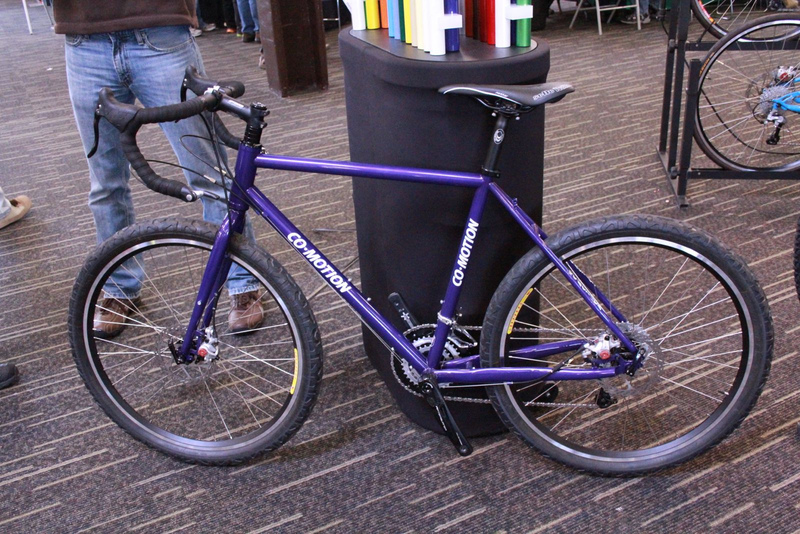 To me, the bikes marketed for gravel grinders look like cyclocross bikes with eyelets, tall head tubes, and cable routing unsuitable for carrying on your shoulder. Clement, today a re-boot of the venerable tyre brand, offers a couple of treads 700C (35 & 40mm) targeting face-paced dirt road riding. It’s interesting to me that gravel grinder bikes are taking recent market trends in equipment and using them to participate in a genre of riding that is close to what road riding/racing was in its earliest days. Meanwhile a segment of the randonneur crowd clings to very traditional steel bikes and archaic centre-pull brakes for very similar riding, albeit typically on smoother roads. I’ll agree with Bicycle Quarterly’s Jan Heine that the optimal tyre size for speed and comfort on gravel roads is smaller than 2”/51mm, more like in the 35-45mm range. Jan’s ideal of bike is one that takes a 650Bx42mm tyre (with fenders, of course), a low trail steering geometry, and a sizable bag supported my a front rack. Though certainly not a universal perspective within the rando crowd, it is closest to the French cyclo-touriste traditions that were the genesis of randonnee. The 650B tyre/rim standard might have faded into history if it had not been for influence of Japanese bike company Grand Bois commissioning Panaracer to make suitable, high quality tyre offerings. The primary benefit that 650B offers to randonneurs is that it offers a large volume tyre (35-43mm wide) that is practically the same outer diameter as a road racing 700Cx23mm, thereby allowing fender clearance within conventional frame geometry. The wide tyre with supple casing offers and exceptionally smooth ride over long 1200km epics while still having low rolling resistance; indeed, Heine strongly argues that 650Bx43 has decidedly lower rolling resistance than 700Cx23. However, in a move that could not have been predicted, there has been a veritable explosion of 650B development driven by the mountain bike segment. As the “tweener” size between twenty-six and 29er, 650B (blasphemously referred to as 27.5” by marketing douchebags) offers a portion of the superior traction, ride, and low rolling resistance of 29er in a smaller package more suited to long travel suspension and smaller frame sizes. As a result, 650B rims currently on the market are largely disc brake-specific, and tyre choices fall exclusively into two genres: a handful of 32-43mm rando-style road treads and rapidly expanding selection of 2.2-2.4” (56-60mm) knobbies. Cyclocross bikes are meanwhile becoming more competition focused. With the UCI’s recently reduced maximum tyre size of 33mm, there is no impetus for the big manufacturers to make bikes that have really generous tyre clearances. If anything, the rush to disc brakes might accentuate this in the short term until manufacturers decide if they can access consumer demand for more versatile bikes. Shorter chainstays and lower bottom brackets are trending on today’s cyclocross bikes, optimizing the bikes for less technical courses (meaning more like packed gravel or grassy fields than singletrack), faster speeds, and powerful bursts of speed. Disc brakes are a super hot topic at the moment, as SRAM and Shimano are very close to officially announcing hydraulic brake levers with fully integrated shifters for dropbars. In the future we can assuredly expect disc brakes to have a profound impact on road bikes, but as professional sport is hugely important as a tool for both marketing and technical development, look for products to come from cyclocross, a discipline wherein the UCI allows disc brakes, unlike road cycling.